The following page was my first attempt, written to help me come to terms with evidence as I worked through my doubts and became convinced of the lack of sound evidence for Anthropogenic Global Warming. It was a forerunner of the current Skeptics' Climate Science Primer, and may thus be closer psychologically to AGW believers - but it may also hold a science that is naive at times. The blue menu bar above shows the current (preferred) range of my climate science work. The Intergovernmental Panel on Climate Change (IPCC) used this graph as part of its key information. The sudden rise of the global mean temperature in the 20th century, causing the "hockey stick" effect after at least ten centuries of falling temperatures, seems undeniable. The effect from 1995 to 2004 is visible worldwide. This seems to challenge the CO2-temperature link of the last 25 years. As I investigated here, here, here, here, etc I discovered evidence that Michael Mann's famous "hockey stick", key evidence used by IPCC, has been discredited. Then I found more evidence that still seemed to be using it. How tiresome. The chart shows a stable climate for a thousand years followed by a dramatic increase in the 20th century. It appears that the maths used could make a hockey stick out of anything. The raw data and algorithms were hidden from public and scientific scrutiny for almost a decade, an act that should have disqualified his work from serious consideration among scientists. Now the hiding of key data is suspected here as well. ...serious global warming started from a low point in 1905 or so, and until 1940 warmed more quickly than in the post-1975 period. What caused that huge earlier quantity of warming? - it was certainly not CO2... And what caused the 1940-1970 cooling? Could there be major unrecognized natural causes here? First graph by John Cook "I created the graph myself from TSI data emailed to me from Sami Solanki (co-author of Usoskin 2005)..."
There are other significant areas of uncertainty – on cloud cover data, radiation flux levels to the surface, ocean heating, Arctic amplification, and the past and future activity levels of the sun – areas where there is quite definitely a lack of consensus in the scientific community. On several of these key issues, this lack of consensus appears in the technical sections of the IPCC’s Fourth Report in 2007 – and on some issues, such as ocean warming where there is serious recent debate, the issue is not covered because the IPCC did not update its review on this particular field. In contrast, when a single paper appeared in 2007 that challenged the analysis [doubted the effect on climate] of solar magnetic flux, this paper was included and given great weight. Peter Taylor has worked with governmental advisory bodies as well as with organizations such as Greenpeace. He is a scientist with a track record for picking up early warning signs of global issues needing serious attention. He is aware that the attention given to consensus Climate Science can easily eclipse the far more serious issues of Peak Oil, of building social and personal resilience generally to a future that will be tough otherwise, and of seeing the dangers inherent in our whole present political and economic paradigm of growth. This well-argued work deserves widespread study. Peter Taylor's website is at http://www.ethos-uk.com where you can download his Climate Science Review. Peter Taylor might sound like one of the "tiny number" of scientists that Al Gore calls the "kooks or crooks" who don't agree with the "consensus". Well, here is a book and here are stories and lists of a great many extremely able scientists at the tops of their profession, who also doubt the "consensus" view of global warming, or even that there is any consensus. can it be a case of The Emperor's New Clothes? The underlying challenges to AGW seem to be too obvious and too simple to believe. If true, they make it embarrassing to all who are AGW experts, researchers, promoters, and activists. "To think we might have let ourselves get carried away" is not a comfortable idea to examine. And if we decide that AGW, Al Gore and IPCC are seriously wrong and bad science, it's easy to scapegoat and blame anyone but ourselves, although the challenging evidence is actually rather ovbious... But at least we are starting to think about our effects on the planet, and despite a bad start, this is important. In future we will need to develop this thinking a great deal, with increasing experience, into a more holistic hard-knowledge-backed intuitive sensitivity. The challenges appear to be backed up by the evidence. Scrutiny needs intelligence, persistence, openness, and willingness not just to take anyone's word for things (commonsense and courtesy help too!). There is a veritable minefield of conflicting "evidence" - I've found both truth and inaccuracy, fairness and bias, politeness and rudeness, on all sides. As I've gradually reconsidered everything, it has come to seem more and more likely that competent scientific challenges have been blocked from peer reviews they deserve. The Internet can help - and can hinder. The basic key IPCC graph, which shows the temperature rise over the last century, has serious and rather obvious questions hanging over it. These questions are not satisfactorily answered or even addressed by the IPCC. One would think that such obvious queries should be the first to be answered, to help the public take AGW seriously. But I'm still looking for such basic AGW information - not the basic "facts" of AGW but the first level of scientific proof, with answers to the skeptics' challenges at this first level... See here. For ten years, temperatures have failed to rise at all, let alone at predicted high rates. This new factor makes the questions to the main IPCC graph stand out all the more. These questions may have a scientific answer, but where is it in a form that intelligent lay people with little time to spare can grasp? See here again. Computer modelling is highly imprecise. It is only credible for forecasting the future, if ALL past data are accommodated with a clear fit - which is not the case in the IPCC scenario - as IPCC admit. And the models do not even include water vapour which is by far the biggest greenhouse effect, far, far bigger than CO2. Though modellers say that water vapour is influenced by CO2 to amplify its effect, this is not proven. There is data evidence for a far more potent driver of cloud cover - cosmic rays. And though this is doubted by orthodoxy, perhaps the focus on doubting or ignoring cosmic rays is because it really is a big, clear challenge to the whole AGW hypothesis - and hence a threat. Many anomalous facts exist which strongly suggest that recent global warming cannot be due even principally to CO2. Anomalies exist in paleo-climate records, in recent records, and in several current research works - of particular interest is the suggestion of a link between solar magnetic flux (230% increase last century), cosmic rays, and cloud cover (has been neglected in modelling and in data collection). See here, here, here, here, and here. There is both good and bad science on all sides, as well as fluctuations in courtesy and scientific openness. When one considers oneself an expert in certain fields, it is all too easy to dismiss work that may have vital evidence, on the ground of secondary faults in one's field of expertise, spotted by one's trained eye. Thus the cosmic-ray issue is literally under a cloud at present - although the palaeo record shows strong evidence of climate effects of cosmic rays. Scientists challenging the consensus find their jobs and funding are threatened. There is anecdotal evidence for this (eg here, 14 Feb 08). This could just be scientists who are bad scientists but have wild ideas, however, if true, it would be likely that most of these scientists would not want to be publicly known for their stance, and all this makes verification difficult. Meanwhile, Al Gore's film and the AGW lobby insist that there is "consensus" among scientists, that "the debate is over", and that we are dealing with "facts" not hypotheses. But look here, here, here, and here, to see that the notion of "consensus" is challenged by a large number of first-rate scientists, many of whom are at the top of their profession. 700 scientists who challenge IPCC: The US Senate Committee on the Environment lists 700 scientists who disagree with the anthropomorphic global warming hypothesis. This is not just a list but a very long account with a paragraph on each scientist or event, with hyperlinks. This "Inhofe's 400" has attracted more rude criticism from AGW supporters than most other issues, and initially this criticism convinced me. But after examining the list properly, I think the criticism could have happened precisely because this represents a fair challenge to AGW - and a big threat. Read its detractors (eg Dressler) by all means, but go to source and read it direct for yourself - and note what it says about Dressler. Falsehoods in Gore's An Inconvenient Truth by Wm Robert Johnstone includes: Misleading links between weather events and climate change; Misrepresentation of data; Exaggerations about sea level rise; Misleading claims about effects of climate change; Reliance on worst-case scenarios; False claims about scientific views on global warming; Misleading claims about the responsibility of the United States; Conceptual errors. Now one may not agree with all but there are a huge number of misrepresentations of data and false claims about scientific views: 75 points altogether are challenged in this well-presented academic essay, which does not appear to serve any predetermined agenda other than concern for truth. 35 Inconvenient Truths by Monckton of Brenchley for Science & Public Policy Institute: SPPI is routinely dismissed rudely by AGW supporters. We don't have to agree with everything on the website to see that this page has a lot of strong evidence that Al Gore was cherrypicking extensively, and was frequently inaccurate in serious ways. SPPI may be supported by oil barons - but that does not rule out the testimony of this page. The Case for Skepticism on Global Warming by Michael Crichton seems to be pretty fair, and reasonably good science, and actually takes the reader inside the labyrinths of the indigestible IPCC wording and what it actually says and doesn't say. The fact that Crichton wrote Jurassic Park is a bonus: he has an eye for presenting material attractively. 200 Peer-reviewed Articles criticizing AGW This is an interesting, possibly crucial, but very mixed source which I include to show the sifting that's needed, and to show how fatally easy it is to pick holes in one's opponent's argument, whichever side one supports, without ever really engaging properly, without really considering the basics which go back to "what is Truth? what is Science? what really matters here? how can we use courtesy to help each other grow?" etc. The Hadley Centre has a published record of "monthly globally averaged land and sea surface temperature" that goes back to 1850. Global temperatures have risen over the period, but a closer look at the record shows that this has been anything but steady. Actual measurements of atmospheric CO2 concentration only started in 1958. IPCC estimates based on ice core readings go back to pre-industrial times. These show an estimated gradual increase from around 285 ppm in 1850 to 315 ppm in 1958, when actual measurements started. See the IPCC 2007 SPM report. CO2 concentrations have risen steadily over the entire period. The rate of increase has accelerated slightly, particularly following WWII. There are three warming periods that contributed to the overall warming plus two periods of cooling and the most recent "plateau" showing essentially no change. 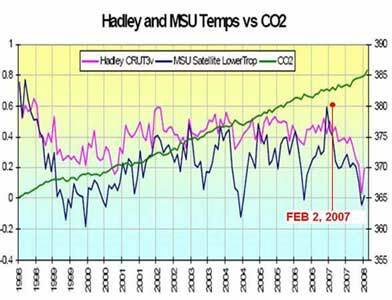 And it appears that last 25 years of the 20th century provide the only observed link between CO2 and temperature. The immediately preceding period had CO2 increase with cooling. The immediately ensuing period since the end of the 20th century shows slight cooling with high increase in CO2. The late 19th century warming period showed the highest rate of temperature increase of all periods recorded, with essentially no CO2 increase whatsoever. The early 20th century warming period also showed warming, with relatively small increase in CO2. These observed data show that there does not appear to be a very "robust" link between atmospheric CO2 concentration and global temperature. IPCC has used the late 20th century warming cycle to demonstrate the anthropogenic cause, stating in its AR4 WG1 report Chapter 9 (p.681): "The simulations also show that it is not possible to reproduce large 20th-century warming without anthropogenic forcing regardless of which solar or volcanic forcing reconstruction is used,... stressing the impact of human activity on the recent warming." In other words, since no other cause can be identified to explain the observed warming other than anthropogenic forcing (from greenhouse gases), this must be the cause by default. Most damaging for this assumption is the fact that no analysis has been made of the two prior warming periods in order to support this suggestion, despite the fact that these periods together count for 70% of the warming observed over the entire record. Strangely IPCC does not even mention the late 19th century period that showed the highest decadal rate of temperature rise of all periods since their measurements started. Moreover, between 1680 and 1710 temperatures rose more, and more rapidly, than the whole twentieth century saw. Between 1690 and 1700 the mean temperature rose from 8ºC to 9ºC. As regards the warming period of the early 20th century, IPCC states (p.691): "Detection and attribution as well as modelling studies indicate more uncertainty regarding the causes of early 20th-century warming than the recent warming." There are apparently "unexplained" causes resulting in "uncertainty", but [*] no studies have been made to clear up this uncertainty and attempt to understand how large an impact these "unexplained" causes might have had. Could these same "unexplained" causes have been the principle forcing factor for the late 20th century warming, rather than the assumed "anthropogenic forcing" from greenhouse gases? How can we be sure this is not the case? Only by making these analyses and clearly identifying that there were no major "unexplained" factors in the two earlier warming periods can one make the claim that AGW is the predominant forcing factor for late 20th century warming. To simply assert that this is so "by default" since no other explanation can be found is no argument at all. Is this the "fatal flaw" in the AGW theory? Many commentators have assumed that the dip since 1945, when the carbon dioxide theory would have required continued warming, can be explained by volcanic dust and anthropogenic sulphates – so called, ‘global dimming’. This thesis was based upon inputs to computer models of sulphate pollution and observations of volcanic activity and atmospheric dust loads – but I have yet to trace and review the original papers that were used in support of these model inputs... I can find only passing comments with no references. The thesis is often quoted even in respected peer-reviewed journals, but with no reference to the data that would support the conclusion – perhaps because it was derived from modelling studies and the authors of these papers simply refer to the modelling results. Here are telling but strictly unverified "anecdotal" evidence I picked up from sceptics' discussion blogs. This is always the way in which alerting evidence appears: very seldom can it leap straight into the heavily-protected peer reviews - and rightly so - but this early evidence is still crucial to hear. Dr. Robinson: In those curves, the temperature goes up before the CO2 and goes down before the CO2. The CO2 lags the temperature. 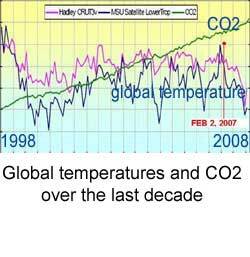 And the reason it does is that the CO2 rise is caused by the temperature rise rather than vice versa. As temperatures rise, carbon dioxide is released from the oceans, just as the carbon dioxide is released from soft drinks when their temperature rises. [Recent ice studies show the temperatures changed about 800 years before the CO2 levels.] Gore shows the curves with poor resolution, so that this cannot be seen by the viewer. 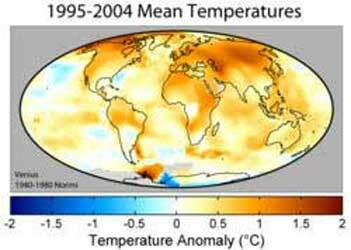 The Earth’s warming since 1850 totals about 0.7 degrees C. Most of this occurred before 1940. The cause: a long, moderate 1,500-year climate cycle first discovered in the Greenland ice cores in 1983. The cycle abruptly raises our temperature 1 to 3 degrees C above the mean for centuries at a time--as it did during the Roman Warming (200 BC to 600 AD) and Medieval Warming (950 to1300 AD). Between warmings, Earth’s temperatures shift abruptly lower by 1 to 3 degrees C--as they did during the 550 years of the Little Ice Age, which ended in 1850. The ice cores and seabed fossils show 600 of these 1,500-year cycles, extending back at least 1 million years. The atmosphere is approaching CO2 saturation--after which more CO2 will have no added climate forcing power. From the Vostok ice core data, during glacial periods, often a rising temperature trend with a rising carbon dioxide level suddenly changed direction and became a falling temperature trend in spite of the carbon dioxide level being higher than when the temperature was increasing. This could not be if carbon dioxide causes a positive feedback. The Andean-Saharan Ice Age occurred when the carbon dioxide level was over ten times its current level. What is different now that could lead to runaway temperature increase? The determination that non-condensing greenhouse gases have no significant influence on average global temperature is not refuted by any climate history. Read here about the diminishing solar activity and the possibility of another Maunder minimum and "Little Ice Age"
Is The "Scientific Consensus" on Global Warming a Myth? Al Gore and his media allies claim the only scientists who dispute the alarmist view on global warming are corrupt crackpots and "deniers", comparable to neo-Nazis who deny the Holocaust. These men who expose Gore's claims as absurd hold top positions at the most prestigious scientific institutes in the world. Their work is cited and acclaimed throughout the scientific community... Al Gore says any scientist who disagrees with him on Global Warming is a kook, or a crook. from Michigan Pete, comment at Gristmill on 26-04-08: I think we need to stop worrying about the polar bears... A survey of the animals' numbers in Canada's eastern Arctic has revealed that they are thriving, not declining... In the Davis Strait area, a 140,000-sq kilometre region, the polar bear population has grown from 850 in the mid-1980s to 2,100 today. "There aren't just a few more bears. There are a hell of a lot more bears," said Mitch Taylor, a polar bear biologist who has spent 20 years studying the animals."